SUPERGIRL FACES HER BIGGEST CHALLENGE YET — Supergirl (Melissa Benoist) must deal with the destructive aftermath of Lex’s (guest star Jon Cryer) nefarious plans. Shocked at what Lex has created, Supergirl faces her biggest challenge yet. Ben Bray directed the episode with story by Gabriel Llanas and teleplay by Katie Rose Rogers & Brooke Pohl (#417). Original airdate 3/31/2019. THE BATTLE CONCLUDES - Supergirl (Melissa Benoist), The Flash (guest star Grant Gustin), Green Arrow (guest star Stephen Amell) and Superman (guest star Tyler Hoechlin) engage in the battle of their lives. Jesse Warn directed the episode with story by Marc Guggenheim and teleplay by Derek Simon & Robert Rovner (#409). Original air date 12/11/2018. KEVIN SMITH DIRECTS; NIA BEGINS TO EMBRACE HER POWERS - Nia (Nicole Maines) has a powerful dream about Agent Liberty (Sam Witwer) but refuses to look at it as a prophetic dream and pushes it aside. After noticing something is bothering Nia, Kara (Melissa Benoist) enlists Brainy's (Jesse Rath) help, and the two try to persuade Nia to embrace her destiny. Meanwhile, Manchester Black (guest star David Ajala) pays Ben Lockwood a menacing visit. Kevin Smith directed the episode written by Rob Wright & Eric Carrasco (#408). Original airdate 12/2/2018. THANKSGIVING - Everyone gathers for Thanksgiving but Kara (Melissa Benoist) is feeling down after her televised debate with Ben Lockwood (Sam Witwer) about the anti-alien sentiment coursing through National City. Meanwhile, James (Mehcad Brooks) and Lena (Katie McGrath) argue about the best way to handle the Children of Liberty. Antonio Negret directed the episode written by Gabriel Llanas & Daniel Beaty (#406). Original airdate 11/18/2018. MEET THE LEGION - Struggling to heal from her injuries inflicted by Reign (Odette Annable), Supergirl (Melissa Benoist) remains in a dreamlike state, unable to be reached. Mon-El (Chris Wood) recruits one of the Legion members, Brainiac-5 (guest star Jesse Rath), to try to bring her back. Meanwhile, Reign continues her rampage on the city so the DEO teams up with the Legion of Superheroes to try to stop her. Jesse Warn directed the episode written by Derek Simon & Eric Carrasco (#310). Original airdate 1/15/2018. CHAD LOWE GUEST STARS - Kara (Melissa Benoist) investigates a secretive new group whose leader, Thomas Coville (guest star Chad Lowe), has a mysterious connection to Supergirl. Meanwhile, Samantha (Odette Annable) feels like she's letting Ruby (guest star Emma Tremblay) down, and J'onn (David Harewood) confesses an old secret. Jesse Warn directed the episode written by Paula Yoo & Katie Rose Rogers (#304). Original airdate 10/30/2017. SUPERGIRL PREPARES FOR BATTLE - Supergirl (Melissa Benoist) learns the true depth of Serena's (guest star Anjali Jay) nefarious plans for Earth. Supergirl, Mon-El (Chris Wood) and Alura (guest star Erica Durance) must devise a plan to stop her before Serena gets to Earth. J'onn (David Harewood) prepares to say goodbye to his father (guest star Carl Lumby). Armen V. Kevorkian directed the episode written by Ray Utarnachitt & Cindy Lichtman (#322). Original airdate 6/11/2018. SHOCKING SEASON FINALE - Supergirl (Melissa Benoist) and team take on Serena in an epic battle for Earth. Jesse Warn directed the episode written by Robert Rovner & Jessica Queller (#323). Original airdate 6/18/2018. JAMES CONSIDERS UNMASKING AS GUARDIAN – When Tanya (guest star Nesta Cooper), a disciple of Coville’s, escapes from what’s left of his cult, she gives Kara (Melissa Benoist) and James (Mehcad Brooks) a journal that could hold the key to saving Sam (Odette Annable). Someone learns Guardian’s identity and threatens to expose James if he doesn’t do what they ask. James contemplates what it means to be a black vigilante without a mask in America. Mairzee Almas directed the episode written by Paula Yoo & Eric Carrasco (#319). Original airdate 5/21/2018. This episode airs again on Wednesday. REIGN SETS HER SIGHTS ON RUBY – When Reign (Odette Annable) starts hunting Ruby (guest star Emma Tremblay), Supergirl (Melissa Benoist) and Alex (Chyler Leigh) work together to keep her safe. Supergirl and J’onn (David Harewood) look to Sam’s mother (guest star Betty Buckley) for advice on how to stop Reign and come away with some shocking news. Antonio Negret directed the episode with story by Robert Rovner and teleplay by Lindsay Gelfand & Allison Weintraub (#318). Original airdate 5/14/2018. SUPERGIRL TAKES ON ALL THREE WORLDKILLERS - Still reeling after learning about Lena's (Katie McGrath) secret, Supergirl (Melissa Benoist) asks Guardian (Mehcad Brooks) for a favor that could alter his relationship with Lena forever. Meanwhile, with all three Worldkillers united, Supergirl and the team brace for an epic battle. Caitlin Parrish & Erica Weiss directed the episode with story by Jessica Queller and teleplay by Caitlin Parrish & Derek Simon (#317). Original airdate 5/7/2018. SUPERGIRL AND IMRA MUST WORK TOGETHER TO STOP THE THIRD WORLDKILLER - Supergirl (Melissa Benoist) and Imra (guest star Amy Jackson) have different ideas on how to stop the third Worldkiller, Pestilence. However, when both Alex (Chyler Leigh) and Winn (Jeremy Jordan) are seriously injured by Pestilence, Supergirl and Imra team up to stop the destruction. Alexandra La Roche directed the episode written by Gabriel Llanas & Anna Musky-Goldwyn (#316). Original airdate 4/30/2018. J'ONN HAS TO FACE THE TRUTH ABOUT HIS FATHER - When Myr'nn (guest star Carl Lumbly) inadvertently causes psychic disturbances at the DEO, Supergirl (Melissa Benoist) must work with J'onn (David Harewood) to contain the resulting chaos. Meanwhile, Mon-El (Chris Wood) begins training Kara in fighting techniques he's learned in the future for battling Worldkillers. Andi Armaganian directed the episode with story by Eric Carrasco and teleplay by Katie Rose Rogers & Nicki Holcomb (#315). Original airdate 4/23/2018. OSCAR-NOMINATED ACTRESS LAURIE METCALF GUEST STARS - When Winn's (Jeremy Jordan) father dies, his estranged mother, Mary (guest star Laurie Metcalf), reappears trying to reconnect and to explain why she abandoned him all those years ago. Winn is too embittered from his rough childhood to forgive her but when a copycat Toyman attacks, the two must work together to stop him. Mon-El (Chris Wood) tells Kara (Melissa Benoist) something important about the Worldkillers, and Alex (Chyler Leigh) becomes suspicious of Myr'nn's (guest star Carl Lumbly) recent behavior. Glen Winter directed the episode written by Caitlin Parrish & Derek Simon (#314). Original airdate 4/16/2018. MORGAN EDGE THREATENS LENA - Someone tries to kill Morgan Edge (guest star Adrian Pasdar) and he barely survives. He accuses Lena (Katie McGrath) of being behind the attempt and vows to destroy her. When Lena fears her hatred for Morgan will take her to the Luthor dark side, Kara (Melissa Benoist) steps in to help her friend. Meanwhile, after Sam (Odette Annable) realizes she's losing time, she confides in Alex (Chyler Leigh) who decides to run some medical tests to see if she can find out what's going on with her new friend. Tawnia McKiernan directed the episode with story by Robert Rovner and teleplay by Cindy Lichtman & Alix Sternberg (#312). Original airdate 1/29/18. Monday January 22, 2018, 8:00pm Supergirl "Fort Rozz" (All New!, HD, TV-PG, V) Promo SUPERGIRL TEAMS UP WITH SATURN GIRL, LIVEWIRE AND PSI – As Reign (Odette Annable) continues to terrorize the city, Supergirl (Melissa Benoist) teams up with Saturn Girl (guest star Amy Jackson), and the two recruit Supergirl’s former enemies, Livewire (guest star Brit Morgan) and Psi (guest star Yael Grobglas), to form a team for a mission to Fort Rozz to recover a prisoner who has information on how to defeat Reign once and for all. Meanwhile, Alex (Chyler Leigh) babysits Ruby (guest star Emma Tremblay). Gregory Smith directed the episode written by Gabriel Llanas & Anna Musky-Goldwyn (#311). Original airdate 1/22/18. Monday January 15, 2018, 8:00pm Supergirl "Legion of Superheroes" (All New!, HD, TV-14, V) MEET THE LEGION – Struggling to heal from her injuries inflicted by Reign (Odette Annable), Supergirl (Melissa Benoist) remains in a dreamlike state, unable to be reached. Mon-El (Chris Wood) recruits one of the Legion members, Brainiac-5 (guest star Jesse Rath), to try to bring her back. Meanwhile, Reign continues her rampage on the city so the DEO teams up with the Legion of Superheroes to try to stop her. Jesse Warn directed the episode written by Derek Simon & Eric Carrasco (#310). Original airdate 1/15/18. CHAD LOWE RETURNS TO DIRECT; BETTY BUCKLEY GUEST STARS - When Winn (Jeremy Jordan) and the team discover an alien ship has crash landed deep underwater beneath National City, Kara/Supergirl (Melissa Benoist) is called in to investigate. Meanwhile, Hank (David Harewood) attempts to bond with his father, Myr'nn (guest star Carl Lumbly). Samantha (Odette Annable), eager for some understanding of the changes she has been experiencing, looks to her estranged mother, Patricia Arias (guest star Betty Buckley), for answers. Chad Lowe directed the episode written by Gabriel Llanas and Anna Musky-Goldwyn. (#307). Original airdate 11/20/2017. Promo REIGN CHALLENGES SUPERGIRL – Supergirl (Melissa Benoist) investigates a mysterious symbol popping up all over National City, tracing its origins back to an ancient prophecy and the mark of the World Killer, Reign (Odetee Annable). Meanwhile, the tension between Lena (Katie McGrath) and Morgan Edge (guest star Adrian Pasdar) continues to build, causing James to step in and offer up some protection, and possibly igniting a spark in the process. Glen Winter directed the episode written by Paula Yoo & Caitlin Parrish (#309). Original airdate 12/4/17. From EW.com: Andrew Kreisberg hinted there’s a future fun hook up for Alex on Supergirl. Any scoop on that? It’s probably not what you’re expecting, but it’s something I previously thought would be fun — if that gives you any hints. “There’s going to be — I can’t say relationship or even a romance — but Alex is going to have a fun interaction in the upcoming episodes that’s funny and sweet, but also speaks to the Maggie story, which we love,” EP Andrew Kreisberg teases. CHAD LOWE RETURNS TO DIRECT; BETTY BUCKLEY GUEST STARS — When Winn (Jeremy Jordan) and the team discover an alien ship has crash landed deep underwater beneath National City, Kara/Supergirl (Melissa Benoist) is called in to investigate. Meanwhile, Hank (David Harewood) attempts to bond with his father, Myr’nn (guest star Carl Lumbly). Samantha (Odette Annable), eager for some understanding of the changes she has been experiencing, looks to her estranged mother, Patricia Arias (guest star Betty Buckley), for answers. Chad Lowe directed the episode written by Gabriel Llanas and Anna Musky-Goldwyn. (#307). Original airdate 11/20/2017. ESCAPE DOWN MEMORY LANE — Kara (Melissa Benoist) and Alex (Chyler Leigh) head home to Midvale for a little R&R. While there, Kara recalls a painful memory of a childhood friend’s death and how that traumatic experience brought the Danver sisters closer together. Izabela Vidovic plays Young Kara and Olivia Nikkanen plays Young Alex in flashbacks. Rob Greenlea directed the episode written by Caitlin Parrish and Jess Kardos (#306). Original airdate 11/13/2017. MORGAN EDGE SETS HIS SIGHTS ON LENA — When multiple children get sick from lead poisoning, Morgan Edge (guest star Adrian Pasdar) points the finger at Lena (Katie McGrath) and blames her creation of the lead bomb she made to save National City from the Daxamites. While Lena knows she never intended any harm, she fears there may have been a flaw in her design, leaving her responsible. Kara (Melissa Benoist) teams up with Samantha (Odette Annable) to clear Lena’s name, but it turns out to be harder than they thought. Meanwhile, Alex (Chyler Leigh) and Maggie (guest star Floriana Lima) make a crucial decision about the future of their relationship. Kevin Smith directed the episode written by Eric Carrasco & Cindy Lichtman (#305). Original airdate 11/6/2017. CHAD LOWE GUEST STARS — Kara (Melissa Benoist) investigates a secretive new group whose leader, Thomas Coville (guest star Chad Lowe), has a mysterious connection to Supergirl. Meanwhile, Samantha (Odette Annable) feels like she’s letting Ruby (guest star Emma Tremblay) down, and J’onn (David Harewood) confesses an old secret. Jesse Warn directed the episode written by Paula Yoo & Katie Rose Rogers (#304). Original airdate 10/30/2017. CARLOS BERNARD (“24”) GUEST STARS; HELEN SLATER RETURNS — Eliza (guest star Helen Slater) throws Alex (Chyler Leigh) and Maggie (guest star Floriana Lima) a wedding shower, which causes Maggie to reach out to her estranged father (guest star Carlos Bernard). Supergirl (Melissa Benoist) joins J’onn (David Harewood) on a personal mission. Dermott Downs directed the episode written by Jessica Queller & Derek Simon (#303). Original airdate 10/23/2017. YAEL GROBGLAS ("JANE THE VIRGIN") GUEST STARS - Psi (guest star Yael Grobglas), a thief with psychic powers, attacks National City. Able to immobilize people by tapping into their worst fears, Psi proves a formidable opponent for Supergirl. Meanwhile, James (Mehcad Brooks) and Lena (Katie McGrath) are at an impasse, and Samantha starts her new job at L-Corp. David McWhirter directed the episode written by Gabriel Llanas & Anna Musky-Goldwyn (#302). Original airdate 10/16/2017. SUPERGIRL FIGHTS FOR HER CITY; SUPERMAN RETURNS – Supergirl (Melissa Benoist) challenges Rhea (guest star Teri Hatcher) to battle to save National City. Meanwhile, Superman (guest star Tyler Hoechlin) returns and Cat Grant (guest star Calista Flockhart) offers Supergirl some sage advice. Glen Winter directed the episode with story by Andrew Kreisberg & Jessica Queller and teleplay by Robert Rovner & Caitlin Parrish (#222). Original airdate 5/22/2017. "IZOMBIE'S" RAHUL KOHLI GUEST STARS - Lena's (guest star Katie McGarth) ex-boyfriend, Jack Spheer (guest star Rahul Kohli), comes to National City to unveil his big breakthrough in nano-technology, which has the potential to eradicate all diseases. Lena asks Kara to attend Jack's conference with her for support. When Kara sees Snapper (guest Star Ian Gomez) in attendance she's inspired to tap back into her reporter skills and questions Jack on his discovery, which ultimately leads to a bigger investigation that puts everyone in danger. Armen V. Kevorkian directed the episode written by Paula Yoo & Caitlin Parrish (#218). Original airdate 4/24/2017. TERI HATCHER (“DESPERATE HOUSEWIVES,” “LOIS & CLARK: THE NEW ADVENTURES OF SUPERMAN”) AND KEVIN SORBO (“HERCULES”) GUEST STAR; DARREN CRISS (“GLEE”) MAKES HIS DEBUT AS THE MUSIC MEISTER – A new villain (guest star Teri Hatcher) comes to National City, putting Supergirl (Melissa Benoist) on high alert. Meanwhile, Winn’s (Jeremy Jordan) girlfriend, Lyra (guest star Tamzin Merchant), gets Winn in trouble with the law. Maggie (guest star Floriana Lima) attempts to help Winn but old loyalties get in the way. The Music Meister (Darren Criss) attacks Supergirl. John Medlen directed the episode written by Katie Rose Rogers & Jess Kardos (#216). Original airdate 3/20/2017. LIVEWIRE IS SET LOOSE UPON NATIONAL CITY — After Livewire (guest star Brit Morgan) seemingly breaks out of prison, Supergirl (Melissa Benoist) is intent on recapturing her. After training Mon-El (Chris Wood), Supergirl takes him with her when she sees Livewire attack the NCPD but things go awry when Mon-El puts Supergirl before the citizens of National City. Meanwhile, James (Mehcad Brooks) decides to come clean with Kara and M’Gann (guest star Sharon Leal), has a psychic attack and collapses into a coma. Rebecca Johnson directed the episode written by Caitlin Parrish & Katie Rose Rogers (#210). Original airdate 1/30/2017. THE CW HAS A NEW HERO AND SHE'S BRINGING SUPERMAN WITH HER - When a new threat emerges in National City, Kara/Supergirl (Melissa Benoist) teams up with her cousin, Clark Kent/Superman (guest star Tyler Hoechlin), to stop it. Kara is thrilled to have family in town but it leaves Alex (Chyler Leigh) feeling a bit left out. Meanwhile, Hank (David Harewood) and Supergirl are stunned by the pod that came crashing to Earth. Glen Winter directed the episode with story by Greg Berlanti & Andrew Kreisberg and teleplay by Andrew Kreisberg & Jessica Queller (#201). Original airdate 10/10/2016. CAT GRANT RETURNS – Supergirl (Melissa Benoist) grapples with whether or not to obey the President’s (guest star Lynda Carter) orders regarding Rhea’s (guest star Teri Hatcher) latest actions. Meanwhile, Cat Grant (Calista Flockhart) returns to National City. Millicent Shelton directed the episode written by Jessica Queller & Derek Simon (#221). Original airdate 5/15/2017. “THIS IS US” LONNIE CHAVIS GUEST STARS – When an alien attacks National City, Supergirl (Melissa Benoist) and the DEO learn the alien is a Phorian, an otherwise peaceful race with telekinetic powers. Guardian (Mehcad Brooks) gets a lead on the Phorian’s address but instead of finding the culprit, he finds a very scared boy named Marcus (guest star Lonnie Chavis). Marcus will only trust James so it is up to Guardian to stop the attacks on the city. Rhea’s (Teri Hatcher) plan escalates. Ben Bray directed the episode with story by Robert Rovner and teleplay by Gabriel Llanas & Anna Musky-Goldwyn (#220). Original airdate 5/8/2017. 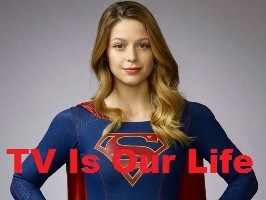 MONDAY, APRIL 10 SUPERGIRL "Homecoming" - (8:00-9:00 p.m. ET) (TV-PG, V) (HDTV) DEAN CAIN RETURNS - When Jeremiah Danvers (guest star Dean Cain) is rescued from Cadmus, Alex (Chyler Leigh) and Kara (Melissa Benoist) are thrilled to have their father back. The Danvers arrange a family dinner to celebrate but things go awry when a suspicious Mon-El (Chris Wood) starts to question Jeremiah about his sudden return. Larry Teng directed the episode written by Caitlin Parrish & Derek Simon (#214). Original airdate 2/27/17. DARREN CRISS (“GLEE”) MAKES HIS DEBUT AS THE MUSIC MEISTER – A new villain (guest star Teri Hatcher) comes to National City, putting Supergirl (Melissa Benoist) on high alert. Meanwhile, Winn’s (Jeremy Jordan) girlfriend, Lyra (guest star Tamzin Merchant), gets Winn in trouble with the law. Maggie (guest star Floriana Lima) attempts to help Winn but old loyalties get in the way. The Music Meister (Darren Criss) attacks Supergirl. John Medlen directed the episode written by Katie Rose Rogers & Jess Kardos (#216). Original airdate 3/20/2017. Monday March 6, 2017 8:00pm Supergirl Exodus (All New!, HD) SNAPPER CARR INTERVIEWS SUPERGIRL – As Alex (Chyler Leigh) searches for Jeremiah (guest star Dean Cain) and Kara (Melissa Benoist) investigates a series of alien kidnappings, the sisters realize they must break the rules to foil a new Cadmus plot. In an effort to get Snapper Carr (guest star Ian Gomez) to run a story that would help her stop Cadmus, Kara agrees to set up an interview between Snapper and Supergirl. Michael Allowitz directed the episode written by Paula Yoo & Eric Carrasco (#215). Original airdate 3/6/2017. Monday February 27, 2017 8:00pm Supergirl Homecoming (All New!, HD) DEAN CAIN RETURNS – When Jeremiah Danvers (guest star Dean Cain) is rescued from Cadmus, Alex (Chyler Leigh) and Kara (Melissa Benoist) are thrilled to have their father back. The Danvers arrange a family dinner to celebrate but things go awry when a suspicious Mon-El (Chris Wood) starts to question Jeremiah about his sudden return. Larry Teng directed the episode written by Caitlin Parrish & Derek Simon (#214). Original airdate 2/27/2017. Monday February 20, 2017 8:00pm Supergirl Mr. & Mrs. Mxyzptlk (All New!, HD) DC COMICS’ MR. MXYZPTLK HITS NATIONAL CITY – When Mr. Mxyzptlk (guest star Peter Gadiot), a magical imp, shows up on Earth and declares his love for Kara (Melissa Benoist), she tries to let him down easy, thinking him harmless. However, he decides it’s a challenge and starts to wreak havoc on National City. Mon-El (Chris Wood) has seen beings like Mr. Mxyzptlk on Daxam and knows how dangerous they can be. He and Kara argue over how to get rid of Mr. Mxyzptlk, further straining their relationship. Meanwhile, Alex (Chyler Leigh) and Maggie (Floriana Lima) celebrate their first Valentine’s Day together. Stefan Pleszczynski directed the episode written by Jessica Queller & Sterling Gates (#213). Original airdate 2/20/17. LIVEWIRE IS SET LOOSE UPON CENTRAL CITY — After Livewire (guest star Brit Morgan) seemingly breaks out of prison, Supergirl (Melissa Benoist) is intent on recapturing her. After training Mon-El (Chris Wood), Supergirl takes him with her when she sees Livewire attack the NCPD but things go awry when Mon-El puts Supergirl before the citizens of National City. Meanwhile, James (Mehcad Brooks) decides to come clean with Kara and M’Gann (guest star Sharon Leal), has a psychic attack and collapses into a coma. Rebecca Johnson directed the episode written by Caitlin Parrish & Katie Rose Rogers (#210). Original airdate 1/30/2017. KEVIN SMITH DIRECTS; ROULETTE RETURNS — Kara (Melissa Benoist) is moved by the story of a missing woman named Izzy (guest star Harley Quinn Smith) and decides to investigate despite Snapper Carr’s (guest star Ian Gomez) order to leave it alone. Kara takes Mon-El (Chris Wood) with her to the last place Izzy was seen and the duo find themselves thrust through a portal to another planet, Slaver’s Moon, where the downtrodden are sold as slaves. The leader of the trafficking ring is none other than Roulette (guest star Dichen Lachman). To make matters worse, Slaver’s Moon has a red sun, which means Kara and Mon-El are stripped of their powers and stuck on the planet with no way home. Meanwhile, back on Earth, Alex (Chyler Leigh) blames herself for Kara’s disappearance, fearing she’s become too focused on her new relationship with Maggie (guest star Floriana Lima) and too complacent in watching out for her sister. Kevin Smith directed the episode with story by Andrew Kreisberg and teleplay by Eric Carrasco & Jess Kardos (#209). Original airdate 1/23/2017. THE CW HAS A NEW HERO AND SHE’S BRINGING SUPERMAN WITH HER — When a new threat emerges in National City, Kara/Supergirl (Melissa Benoist) teams up with her cousin, Clark Kent/Superman (guest star Tyler Hoechlin), to stop it. Kara is thrilled to have family in town but it leaves Alex (Chyler Leigh) feeling a bit left out. Meanwhile, Hank (David Harewood) and Supergirl are stunned by the pod that came crashing to Earth. Glen Winter directed the episode with story by Greg Berlanti & Andrew Kreisberg and teleplay by Andrew Kreisberg & Jessica Queller (#201). Original airdate 10/10/2016. Taking Off Trailer Supergirl Season 2 takes off Monday, October 10 at 8/7c on The CW! New Hero Trailer CW has a new hero! A new season of Supergirl premieres Monday, October 10 at 8/7c on The CW. KARA MUST FIND A WAY TO FREE HER FRIENDS WHEN NON AND INDIGO USE MIND control TO TURN NATIONAL CITY’S CITIZENS INTO THEIR OWN ARMY – Kara (Melissa Benoist) must find a way to free her friends when Non (Chris Vance) and Indigo (Laura Vandervoort) use mind control to turn National City’s citizens into their own army. The episode was written by Yahlin Chang and Caitlin Parrish and directed by Adam Kane (#119). Original CBS airdate 4/11/2016. SUPERGIRL FACES HER GREATEST TEST YET WHEN HER ENEMIES PLAN TO DESTROY EVERY PERSON ON THE PLANET– Supergirl (Melissa Benoist) is forced to do battle with an unexpected foe and must risk everything – including her life – to prevent Non (Chris Vance) and Indigo (Laura Vandervoort) from destroying every person on the planet. The episode was written by Robert Rovner and Jessica Queller and directed by Larry Teng (#120). Original CBS airdate 4/18/2016. J’ONN J’ONZZ REVEALS THE DETAILS OF MEETING KARA AND ALEX’S FATHER, DR. JEREMIAH DANVERS, AND ASSUMING HANK HENSHAW’S IDENTITY – J’onn J’onzz (David Harewood) reveals the details of meeting Kara (Melissa Benoist) and Alex’s (Chyler Leigh) father, Dr. Jeremiah Danvers (Dean Cain), and assuming Hank Henshaw’s (David Harewood) identity. Also, Kara debates trusting someone new with her secret identity and Siobhan (Italia Ricci) plots against Kara. The episode was written by Cindy Lichtman and Rachel Shukert and directed by Chris Fisher (#117). Original CBS airdate 3/21/2016. SUPERGIRL GAINS A NEW ALLY WHEN THE LIGHTNING-FAST SUPERHERO ‘THE FLASH’ HELPS HER BATTLE LIVEWIRE AND SILVER BANSHEE – Kara (Melissa Benoist) gains a new ally when the lightning-fast superhero The Flash (Grant Gustin) suddenly appears from an alternate universe and helps Kara battle Siobhan, aka Silver Banshee (Italia Ricci), and Livewire (Brit Morgan) in exchange for her help in finding a way to return him home. Grant Gustin crosses over as The Flash. The episode was written by Andrew Kreisberg and Michael Grassi and directed by Nick Gomez (#118). Original CBS airdate 3/28/2016. SUPERGIRL DOES BATTLE WITH INDIGO, A DANGEROUS BEING WHO CAN TRANSPORT VIA THE INTERNET AND HAS A CONNECTION TO KARA’S PAST – Kara (Melissa Benoist) travels to Superman’s Fortress of Solitude in hopes of learning how to defeat Indigo (Laura Vandervoort), a dangerous being who can transport via the internet and who has a connection to Kara’s past. Also, James’s (Mehcad Brooks) relationship with Lucy (Jenna Dewan-Tatum) reaches a crossroads. The episode was written by Anna Musky-Goldwyn and James DeWille and directed by Dermott Downs (#115). Original CBS airdate 2/29/2016. KARA TURNS ON HER FRIENDS AND THE CITIZENS OF NATIONAL CITY AFTER BEING EXPOSED TO RED KRYPTONITE MAKES HER MALICIOUS AND DANGEROUS – Kara (Melissa Benoist) turns on her friends and the citizens of National City after being exposed to Red Kryptonite makes her malicious and dangerous. Also, Cat (Calista Flockhart) appears on “The Talk” to discuss Supergirl. The hosts of CBS Daytime’s THE TALK guest star. The episode was written by Robert Rovner and Jessica Queller and directed by Larry Teng (#116). Original CBS airdate 3/14/2016. A PARASITIC ALIEN TRAPS KARA IN A DREAM WORLD WHERE HER HOME PLANET WAS NEVER DESTROYED – Kara’s (Melissa Benoist) friends must find a way to save her life when a parasitic alien attaches itself to her and traps her in a dream world where her family is alive and her home planet was never destroyed. Also, Alex (Chyler Leigh), Hank (David Harewood) and the DEO (Sarah Robson) must fend off a Kryptonian attack while Kara is out of commission. The episode was written by Ted Sullivan and Derek Simon and directed by Dermott Downs (#113). Original CBS airdate 2/8/2016. SUPERGIRL BATTLES THE DEADLY MASTER JAILER, WHO IS TRACKING DOWN AND EXECUTING ESCAPED FORT ROZZ PRISONERS - Supergirl (Melissa Benoist) does battle with the deadly Master Jailer (Jeff Branson), who is tracking down and executing escaped Fort Rozz prisoners. Also, Cat (Calista Flockhart) hires a second assistant (Italia Ricci), who immediately tries to one-up Kara, and Kara and James (Mehcad Brooks) disagree over the DEO's methods. The episode was written by Yahlin Chang and Caitlin Parrish and directed by Lexi Alexander (#114). Original CBS airdate 2/22/2016. KARA MUST HELP HANK BATTLE A MEMBER OF THE ALIEN RACE WHICH WIPED OUT HIS PEOPLE – Kara (Melissa Benoist) must help Hank (David Harewood) face his painful past when a White Martian, a member of the alien race which wiped out his people, kidnaps Senator Miranda Crane (Tawny Cypress), an anti-alien politician. Also, Cat’s estranged son, Adam (Blake Jenner), arrives in National City. The episode was written by Michael Grassi and Caitlin Parrish and directed by Glen Winter (#111). Original CBS airdate 1/25/2016. KARA FACES OFF AGAINST HER MIRROR IMAGE WHEN A TWISTED VERSION OF SUPERGIRL SETS OUT TO DESTROY HER – Kara (Melissa Benoist) faces off against her mirror image when Bizarro (Hope Lauren), a twisted version of Supergirl, sets out to destroy her. Also, Kara grows closer with Cat’s son, Adam (Blake Jenner). The episode was written by Roberto Aguirre-Sacasa and Rachel Shukert and directed by John Showalter (#112). Original CBS airdate 2/1/2016. KARA IS PULLED IN OPPOSITE DIRECTIONS WHEN SHE BABYSITS CAT’S SON WHILE TRYING TO STOP A SERIES OF BOMBINGS – Kara’s (Melissa Benoist) two identities are each stretched thin when Supergirl must protect National City from a series of bombings and Kara is tasked with babysitting Cat’s son, Carter (Levi Miller). Also, James (Mehcad Brooks) is conflicted when Lucy Lane (Jenna Dewan-Tatum), his ex-girlfriend, seeks to rekindle their relationship. The episode was written by Yahlin Chang and Ted Sullivan and directed by Thor Freudenthal (#104). Original CBS airdate 11/23/2015. ANGER GETS THE BETTER OF KARA WHEN SHE GOES TOO FAR DURING A TRAINING EXERCISE WITH RED TORNADO, A MILITARY CYBORG COMMISSIONED BY LUCY’S FATHER – Personal and professional stress get the better of Kara (Melissa Benoist) when she goes too far during a training exercise against Red Tornado, a military cyborg commissioned by Lucy’s father, General Sam Lane (Glenn Morshower). Also, Cat’s tough exterior is shaken when her judgmental mother, Katherine (Joan Juliet Buck), visits, and Alex (Chyler Leigh) enlists Winn (Jeremy Jordan) to look into her father’s mysterious death. The episode was written by Michael Grassi and Rachel Shukert and directed by Jesse Warn (#106). Original CBS airdate 11/30/2015. SUPERGIRL IS TARGETED BY ONE OF SUPERMAN’S ENEMIES – Supergirl’s (Melissa Benoist) powers are tested when Reactron (Chris Browning), one of Superman’s formidable enemies, arrives in National City and targets the young hero. Also, Cat plans to run an exposé on Supergirl. The episode was written by Michael Grassi and Rachel Shukert and directed by Dermott Downs (#103). Original CBS airdate 11/9/2015. KARA’S THANKSGIVING MAY BE RUINED WHEN HER FOSTER MOTHER COMES FOR A TENSE VISIT AND A VOLATILE CATCO EMPLOYEE IS TRANSFORMED INTO THE VILLAINOUS LIVEWIRE – Kara’s (Melissa Benoist) Thanksgiving plans may be ruined when she suspects her foster mother, Dr. Danvers (Helen Slater), disapproves of her new role as a superhero. Also, when an accident transforms a volatile CatCo employee into the villainous Livewire, she targets Cat (Calista Flockhart) and Supergirl. The episode was written by Roberto Aguirre-Sacasa and Caitlin Parrish and directed by Kevin Tancharoen (#105). Original CBS airdate 11/16/2015. “Better Angels” – Supergirl is forced to do battle with an unexpected foe and must risk everything – including her life – to prevent Non and Indigo from destroying every person on the planet, on the first season finale of SUPERGIRL, Monday, April 18 (8:00-9:00 PM, ET/PT) on the CBS Television Network. “Worlds Finest” – Kara gains a new ally when the lightning-fast superhero The Flash (Grant Gustin) suddenly appears from an alternate universe and helps Kara battle Siobhan, aka Silver Banshee, and Livewire in exchange for her help in finding a way to return him home, on SUPERGIRL, Monday, March 28 (8:00-9:00 PM, ET/PT) on the CBS Television Network. Grant Gustin crosses over as The Flash. “Falling” – Kara turns on her friends and the citizens of National City after being exposed to Red Kryptonite makes her malicious and dangerous. Also, Cat appears on THE TALK to discuss Supergirl, on SUPERGIRL, Monday, March 14 (8:00-9:00 PM, ET/PT) on the CBS Television Network. The hosts of CBS Daytime’s “The Talk” guest star. “Solitude” – Kara travels to Superman’s Fortress of Solitude in hopes of learning how to defeat Indigo (Laura Vandervoort), a dangerous being who can transport via the Internet and who has a connection to Kara’s past. Also, James’s relationship with Lucy reaches a crossroads, on SUPERGIRL, Monday, Feb. 29 (8:00-9:00 PM, ET/PT) on the CBS Television Network. “For The Girl Who Has Everything” – Kara’s friends must find a way to save her life when a parasitic alien attaches itself to her and traps her in a dream world where her family is alive and her home planet was never destroyed. Also, Alex, Hank and the DEO must fend off a Kryptonian attack while Kara is out of commission, on SUPERGIRL, Monday, Feb. 8 (8:00-9:00 PM, ET) on the CBS Television Network. “Bizarro” – Kara faces off against her mirror image when Bizarro (Hope Lauren), a twisted version of Supergirl, sets out to destroy her. Also, Kara grows closer with Cat’s son, Adam (Blake Jenner), on SUPERGIRL, Monday, Feb. 1 (8:00-9:00 PM) on the CBS Television Network. “Childish Things” – Kara does her best to support Winn when his father, the supervillain Toyman, breaks out of prison and seeks out his son for unknown reasons. Also, Cat offers Lucy a job at CatCo and Alex asks Hank to use his powers to help uncover Maxwell Lord’s plans, on SUPERGIRL, Monday, Jan. 18 (8:00-9:00 PM, ET/PT) on the CBS Television Network. Henry Czerny guest stars as Winslow Schott, Sr., aka Toyman. “Blood Bonds” – With Astra in captivity at the DEO, her husband, Non (Chris Vance), captures Hank, leading to a tense standoff between the two sides. Also, Kara continues to refute Cat’s allegations that she is Supergirl, on SUPERGIRL, Monday, Jan. 4 (8:00-9:00 PM) on the CBS Television Network. “Hostile Takeover” – Kara goes toe-to-toe with Astra when her aunt challenges Kara’s beliefs about her mother. Also, Cat is threatened with being removed as the CEO of CatCo after a hacker exposes her private and damaging emails, on SUPERGIRL, Monday, Dec. 14 (8:00-9:00 PM, ET/PT) on the CBS Television Network. “How Does She Do It?” – Kara’s two identities are stretched thin when Supergirl must protect National City from a series of bombings and Kara is tasked with babysitting Cat’s son, Carter. Also, James is conflicted when his ex-girlfriend Lucy Lane seeks to rekindle their relationship, on SUPERGIRL, Monday, Nov. 23 (8:00-9:00 PM, ET/PT) on the CBS Television Network. Levi Miller guest stars as Carter Grant, Cat’s son, and Jenna Dewan-Tatum guest stars as Lucy Lane. Editor’s note: This replaces the previously scheduled episode. “Livewire” – Kara’s Thanksgiving may be ruined when she suspects her foster mother, Dr. Danvers (Helen Slater), who is coming to town, disapproves of her new role as a superhero. Also, when an accident transforms a volatile CatCo employee into the villainous Livewire, she targets Cat and Supergirl, on SUPERGIRL, Monday, Nov. 16 (8:00-9:00 PM, ET/PT) on the CBS Television Network. Brit Morgan guest stars as Leslie Willis/Livewire and Helen Slater guest stars as Dr. Eliza Danvers, Kara’s foster mother. ‘Supergirl’ spoilers: Cat Grant and the press get involved! “Fight or Flight” – Supergirl’s powers are tested when Reactron, one of Superman’s formidable enemies, arrives in National City and targets the young hero. Also, Cat plans to run an exposé on Supergirl, on SUPERGIRL, Monday, Nov. 9 (8:00-9:00 PM, ET/PT) on the CBS Television Network. Peter Facinelli guest stars as tech entrepreneur Maxwell Lord. “Stronger Together” – When Kara’s attempts to help National City don’t go according to plan, she must put aside the doubts that she – and the city’s media – has about her abilities in order to capture an escapee from the Kryptonian prison, Fort Rozz. Also, Cat pressures James to use his connection to Superman to get her an interview with Supergirl, when SUPERGIRL moves to its regular time period, Monday, Nov. 2 (8:00-9:00 PM, ET/PT) on the CBS Television Network. Editor's note: The start and end times for this episode have changed. “Pilot” – After 12 years of keeping her powers a secret on Earth, Kara Zor-El, Superman’s cousin, decides to finally embrace her superhuman abilities and be the hero she was always meant to be, on the series premiere of SUPERGIRL, Monday, Oct. 26 (8:31-9:31 PM, ET/PT), on the CBS Television Network. The series moves to its regular time period (8:00-9:00 PM) on Monday, Nov. 2. Find more Supergirl News and Spoilers on our Primetime Forum!